Height is perhaps the most defining characteristic of a basketball player. Fan-favorite point guard Stephen Curry of the Golden State Warriors is considered short at 6’3″ and in the Women’s National Basketball Association, the average height is 6’0″, according to Slate magazine, an online liberal news and entertainment organization. 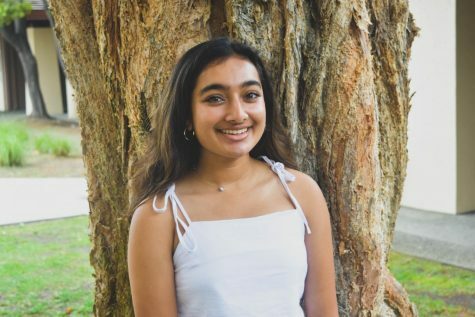 Palo Alto High School freshman and varsity girls’ basketball player Annika Shah stands at 5’2″, a far cry from other players on the team. However, the first thing people learn about Shah is that she doesn’t let her height — or anything else — hinder her from playing exceptional basketball. As a guard and an active part of the Viking’s lineup, Shah demonstrates her ferocity by stealing the ball often and aggressively capturing rebounds. She currently stands at an impressive 17.3 points per game, landing 89 percent of her 2-point shot attempts. For any player, these statistics would be bragging points, but for freshman they are very rare. And for someone of Shah’s physical stature, unheard of. In short, Shah has quickly established herself as a key player on the team, according to her teammate junior Lauren Daniel and coach Scott Peters. Peters echoed this sentiment, adding that Annika’s position on the court adds to what she has achieved so far. Shah was introduced to the sport by her dad, who grew up in Chicago during the Michael Jordan era, which inspired a large affinity to the sport. In first grade, Shah started playing basketball for fun with her dad and older brother in their backyard and at the gym. After discovering that she was not only passionate about basketball but she was good at it, she joined a local team in second grade. “I stuck with it not only because I was good at it at a very young age, but because it was one of the few sports I played that I always wanted to be apart of and play,” Shah said. In third grade, Shah joined an Amateur Athletic Union program called Team Esface, where she continues to play today. Esface is an acronym that stands for Education and Service through Fashion, Athletics, Community and Entertainment according to the Team Esface website. She has also played on a boys’ team since fourth grade with Team Esface, which she says has tremendously helped her basketball career. Shah credits the program with making her both a better basketball player and a better person. “Team Esface is really the only reason why I stand out as a girls’ basketball player,” Shah said. 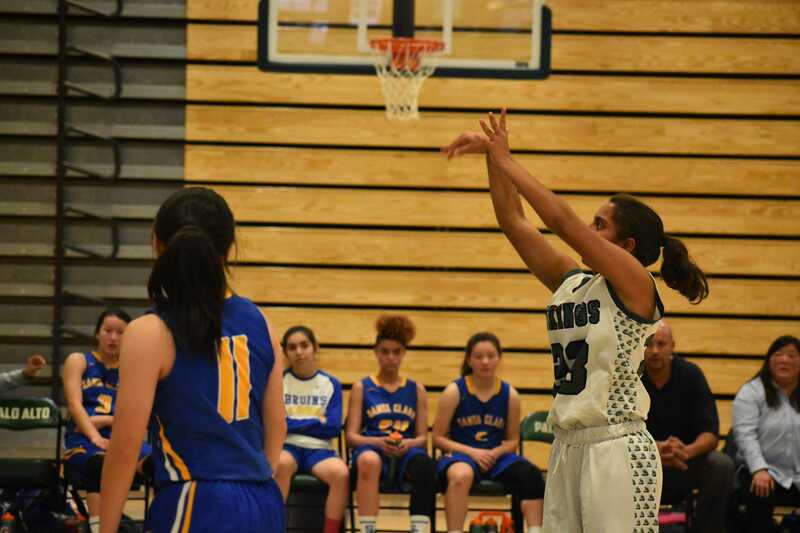 Shah eagerly embraced the opportunity to play for the Paly varsity girls’ basketball team and knew she would have to bring her A-game to help the team win. The girls’ team record is (13-5, 7-0), remaining undefeated in league play. She cites the infectious energy on the team as something that always gets her excited before games. Shah doesn’t let her statistics, such as an aforementioned 17.3 points averaged per game, get to her head. Instead, she focuses on one thing only — contributing to the team in any way she can. “The amount of points doesn’t really matter to me; I just have to have a positive impact on the team,” Shah said. She has already established herself as a key part of the Vikings’ lineup and crushed expectations for a varsity player, especially a freshman. “Many people underestimate the freshmen and I am here to just prove them wrong,” Shah said. Like any good player, Shah has both short-term and long-term goals. She hopes to carry her love for basketball forward through college and afterwards. “I want to pursue basketball through college and as long as I can after that,” Shah said, adding that it would be a difficult task given her height. But she approaches the subject with the same intensity and optimism that has aided her basketball career. “I love to prove people wrong and this is a great opportunity,” Shah said.